New Model! VitaCarry Handheld Electric Pill Grinder! This grinder was featured on Good Morning America as a great gadget for seniors. VitaCarry’s new Handheld Power Pill Grinder is electric, fast, and easy. Easy to use for adults, children, or even pets who have trouble swallowing large pills. 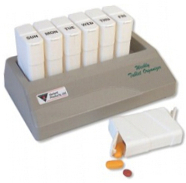 Our VitaCarry automatic pill grinder is even small enough to fit into your pocket! New! Gasketed VitaCarry with ADVANCED Timer features! Advanced features like the “NEXT ALARM” prominently displayed on our Electronic Reminder System will keep you on schedule throughout the day. 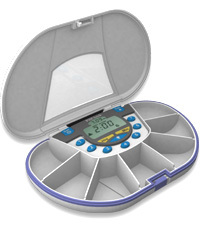 Intuitive programming, missed pill functionality and a convenient backlight make this item a daily “must have” when planning a day’s supplement/meds program. Timer ships with the Gasketed VitaCarry for airtight/watertight protection and is removable to be carried in a pocket or purse if desired. Perfect for daily or multi-day use, the smooth contours and size fit neatly into your pocket or handbag. Sturdy Food Grade plastics are dishwasher safe and will provide years of reliable service. Slim as a compact, the Ultra-Thin design of the Pocket-Size VitaCarry is “so small, it’s practically invisible!” Organize your daily tablet needs in this sleekly contoured case. 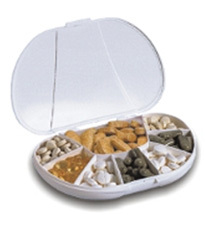 For business or pleasure trips, when an ample supply of supplements or medications is required. Seven roomy compartments keep you organized! NEW Pushbutton technology and a handy safety lock make this a must have over traditional clumsy flip lid designs! Two chamber case with convenient icons built in, can be labeled Rx/V or AM/PM with custom labeling (included). Hundreds of thousands have been sold around the world, with testimonials still rolling in. This is really a great item! Organize your entire week with this simple to use, counter top convenient solution. Seven VitaBuddies come with custom labels for each day of the week. 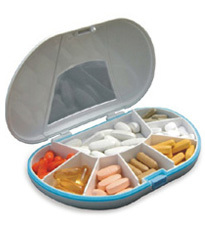 Take a VitaBuddy with you each day – knowing that you will always have an ample supply of meds and vitamins with you! You are currently browsing the archives for the Products category.